Protein. It’s the nutrient everyone wants more of to weigh less. But it’s not always that easy. Find out how much you need, when to eat it and what it should replace to help you get leaner. A new survey from the NPD Group reported that 54% of adults are trying to get more protein in their diets, yet some 71% don’t know how much they should eat. While protein may be gaining in popularity–just look at the number of food products that now claim to have more protein on the labels–the fast majority of us get enough protein and just eating more of it, may lead to weight gain. Many protein seekers don’t understand that you can eat too much and the only way protein helps you get leaner is when you cut total calories and it can only help you build muscle when you are strength training to stimulate muscle repair and synthesis. Here’s a protein primer to help you get the facts you need about your protein requirements, how to time your protein and distribute it throughout the day to maximize its potential to help you lose fat and gain muscle. The RDA for protein is .8 grams per kg body weight or about 50 grams for most women and 60 grams for men. Currently, adult men get, on average, 100 grams of protein per day and women eat some 68 grams per day. While adults are clearly getting adequate protein in their diet, they consume too many calories overall and added sugars and saturated fats, which promotes weight gain. The goal is to keep protein intake up while reducing the calories from the empty-calorie sources to promote fat loss while maintaining lean tissue. When dieting, research shows that eating a higher protein diet (about twice the RDA or about 1 gram protein per pound) and cutting back on carbohydrates can help with losing fat and maintaining muscle mass. In addition, a higher percentage of protein can help manage cravings and hunger to help keep you satisfied when you’re peeling off pounds. Since the body can’t store excess protein for use later, it’s important to distribute protein intake evenly throughout the day. Research shows that about 20-30 grams is sufficient and will maximize the benefits protein provides. Because of this, I recommend 25 grams of protein as part of your breakfast, lunch and dinner. The current protein distribution pattern among U.S. adults isn’t optimal to lose fat and gain muscle. Women eat just 10 grams protein at breakfast (15g for men); 18 grams protein at lunch (27g men) and 30 grams at dinner (44 grams men). Based on this, men eat too much protein at dinner and get about half of what they need at breakfast. Women, on the other hand, only meet the optimal protein intake for dinner. For protein-packed breakfast ideas with 25 grams of protein, read this. What Does 25 Grams of Protein Look Like? Use our list of best protein foods to help guide your choices, but as a general rule 1 oz of fish, lean meat or poultry has about 7 grams of protein so a 3.5 oz serving (about the size of an iPhone) will equal 25 grams of protein. What’s more, most scoops of protein powder have 20-25 grams of protein. If you’re eating Greek yogurt, an 8 oz serving of plain has more than 20 grams of protein, making it an easy way to meet your protein needs at breakfast. High-quality protein can help you build and retain your lean muscle mass by providing your body with the essential amino acids that your muscles need to build and repair after exercise. In fact, one essential amino acid in particular, leucine, appears to be critical for getting leaner and is independently linked to increased muscle protein synthesis. It’s recommended to get 3-4 grams of leucine, which is equal to about 25 grams of high-quality protein. 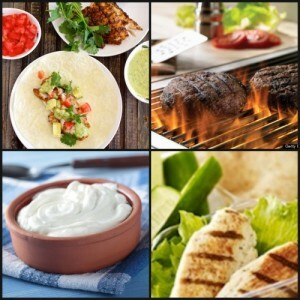 The best sources of leucine include dairy protein, from foods like cottage cheese, yogurt and milk. Egg, beef, poultry and fish are other sources of leucine. For more about leucine, read this. A recent study found that dividing athletes’ total protein intake into three equal servings at breakfast, lunch and dinner resulted in a 25% higher rate of muscle protein synthesis compared to when the same athletes consumed the same total grams of protein, but with most of it at lunch and dinner and significantly less at lunch. The same research group found that consuming 150% of the RDA produced the best results. For most people trying to lose weight, shirting to 1.2 grams protein/kg body weight or even up to 1 gram per pound of lean body mass can help dieters retain their lean tissue while they maximize the amount of fat lost. Adults. J Nutr. 10.3945/jn.113.185280. 2014.